Collectors looking to buy silver in the American Western Skulls Collection have no shortage of options. The popular Wild West-themed series includes various designs and for each design, there are six rounds to choose from when buying. Today, 5 oz Proof Silver American Western Skulls Gambler Rounds are available to you online at Silver.com as one of those options. Rounds ship to you in protective plastic capsules and feature a Certificate of Authenticity! Seventh character to feature in the American Western Skulls Collection! On the obverse side you’ll find the image of the Gambler. 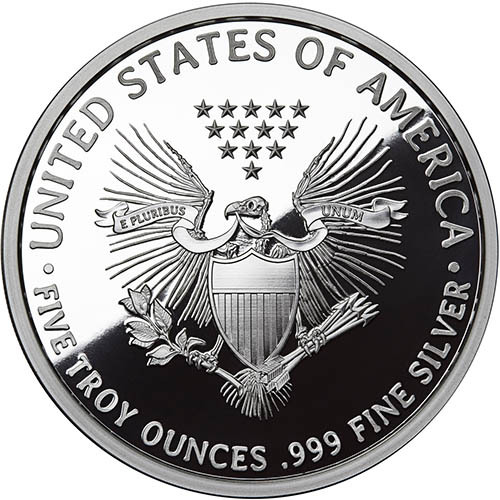 The reverse face of the round includes the design of a fried eagle. The American Western Skulls Collection Gambler design comes with the same options the six previous designs offered to buyers. There is a 1 oz silver round in proof, antique, and colorized proof, as well as a 5 oz silver round in the same three options. While the 1 oz rounds have mintage figures in the low thousands, the 5 oz rounds are all capped at just 500 per issue. All 5 oz Proof Silver American Western Skulls Gambler Rounds are offered to you with a protective plastic capsule to house the round. The rounds each have a unique serial number engraved on the edge which is also printed onto the Certificate of Authenticity included with your purchase. 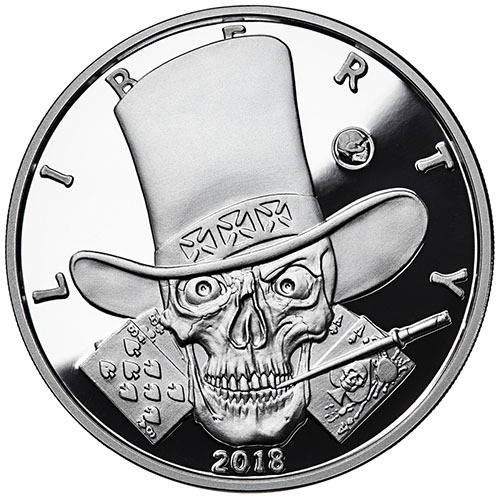 On the obverse of 5 oz Proof Silver American Western Skulls Gambler Rounds, you’ll find the skeletal figure of a gambler. The gambler wears a tall top hat and smokes on a cigarette as a plays a game of poker. You can see his cards on this side as he holds the famed aces-and-eights hand. Known as the Dead man’s hand, it is rumored this was the exact hand Wild Bill Hickok was holding when he was shot dead from behind. The reverse of Proof Silver American Western Skulls Gambler Rounds features the image of a fried eagle. This is a deadly take on the heraldic eagle of the United States. It still features the heraldic shield and cluster of stars from the original design, but replaces a healthy eagle with a dead one that has no feathers at all. These proof versions of the American Western Skulls Gambler Round have matte design elements overlaying mirrored, clear background fields. The contrasting visuals help the design stand out from its background field and catch the eye more easily.